Traditional gambling generally refers to the wagering of money on a yet-to-be determined event or outcome that may be dependent on either chance or skill, or both chance and skill. Casino roulette is a game of chance, while poker is a game of skill. Gambling on athletic sporting events, such as football, basketball, baseball, etc., is generally viewed as involving both skill and chance. And, gambling has been around a long, long time. Gambling has been practiced by humans throughout history. As humans slowly developed and acquired knowledge of the nature of their environment, the attitudes toward and the nature of gambling changed. Today, gambling occurs throughout the entire world. This gambling can take on a variety of sporting forms, including both thoroughbred and dog races along with events such as football, basketball and baseball. Other forms, including Lotto, dice, slot machines, etc., are also prevalent; the former is regularly used by politicians as a means of generating “tax” revenues. Why the above discussion? It’s professional football, i.e., the National Football League (NFL), playoff time. And that means that billions of dollars will soon be wagered on not only the Super Bowl (the championship game) but also all the playoff games leading to the Super Bowl. One of the major gambling options during this period is to “buy a box” in a uniquely arranged square, usually referred to as the pool. An example of a pool is shown in Figure 1 for a Giant-Jet game. As can be seen, there are 100 boxes. If each box costs $1,000, the total cash pool is $100,000. The individual, who correctly selects the box with the last digit of the final score for each team takes home the bacon, i.e., wins the $100,000. 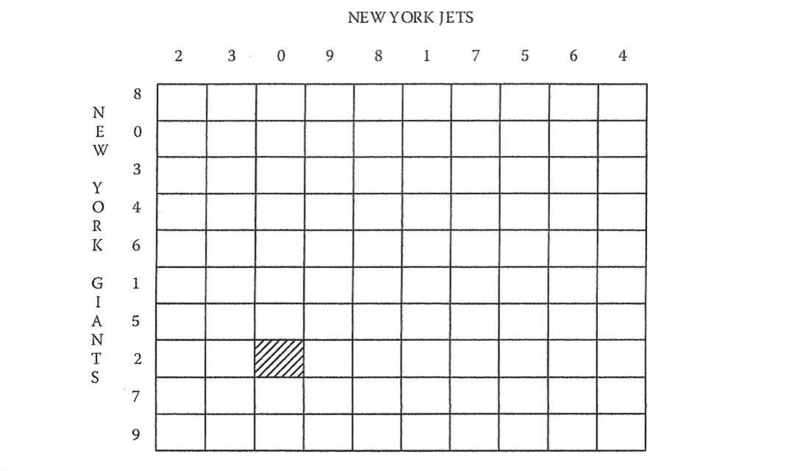 If the final score is Jets 22/Giants 7, the owner of the shaded box is the winner. Scores such as Jets 12/Giants 27 or Jets 22/Giants 37 would also serve as winners for that box. However, employing the format in Figure l does not provide each person buying a box an equal chance of winning. Knowledgeable football fans would immediately realize that the best numbers to select are 0 and 7, whereas the worst are 2, 5, and 6; therefore, the arrangement of the box as in Figure 1 does not provide each bettor with an equal chance to win. This bias can be removed, and the bet reduced to one solely of chance by assigning the numbers to each team in a random manner after individuals have paid and selected a box. The procedure most often used is to write numbers from 0 to 9 (each) on a piece of paper. The 10 pieces of paper are then randomly drawn from a container and sequentially placed along the side of the square – first horizontally and then vertically. The result might look like Figure 2. 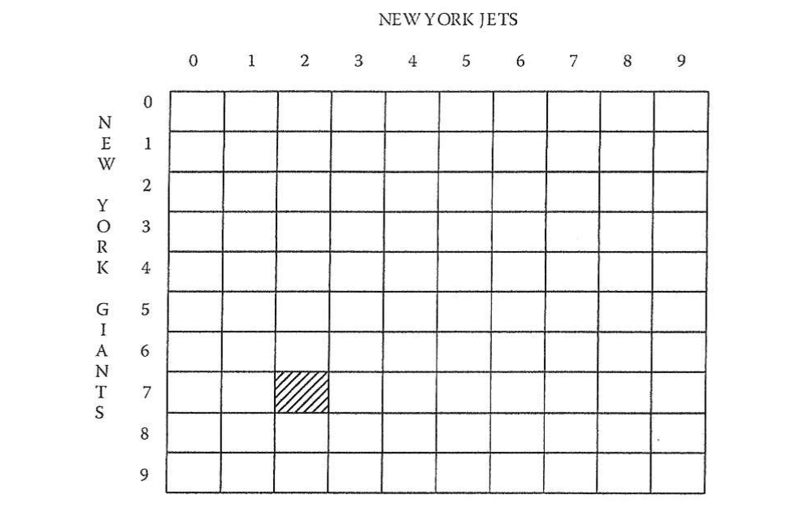 Had the same box been selected (see Figure 2), the bettor’s last team digits would be Giants 2/Jets 0. A final score of Giants 42/Jets 30 would be a winner as would Giants 12/Jets 20. Many gambling activities are available and legal in the U.S. However, the above form of gambling is not legal although it is practiced in private clubs, bars, parties and homes. For example, the football boxes have become an integral part of an annual party that I host at our home for the Killeen’s Tavern basketball team of yesteryear. One of the keys in this betting venture is to ensure that the individual running the box activity does it in a manner that is fair and that the odds are not heavily weighted in favor of the “concessionaire.” Generally, 5 to 10% of the total pool is considered reasonable compensation or takeout for running this illegal business/gambling activity. For whatever it’s worth, there is no takeout at our party, i.e., all of the money is returned to the winners. The topic of March Madness invariably arises in any discussion of this form of gambling. The NCAA Men’s Division 1 Basketball Championship, or March Madness, is a single-elimination tournament – known as the Big Dance – held each spring and features 68 college basketball teams battling to determine the national championship. The box activity has recently worked its way into this sports venue. And, believe this or not, but the box activity is also part of the gambling that takes place with the World Series. Once again, it is the last digit of the final score of the game. Thus, the key box numbers for a winning final score of 11-3 are 1, 3. Good luck to those of you who participate in the football box pool this month and beyond. It’s also that time of the year. Merry Christmas, Happy Holidays, and Happy New Year to the newsletter readers. You are currently browsing the The Theodore Newsletter blog archives for December, 2014.